Planned Parenthood Radio Ads To Target Congressional Opponents : It's All Politics Planned Parenthood is targeting several freshman Republican House members for radio ads that accuse them of focusing on the social issue of abortion rights instead of jobs and the economy, voters' main concern. 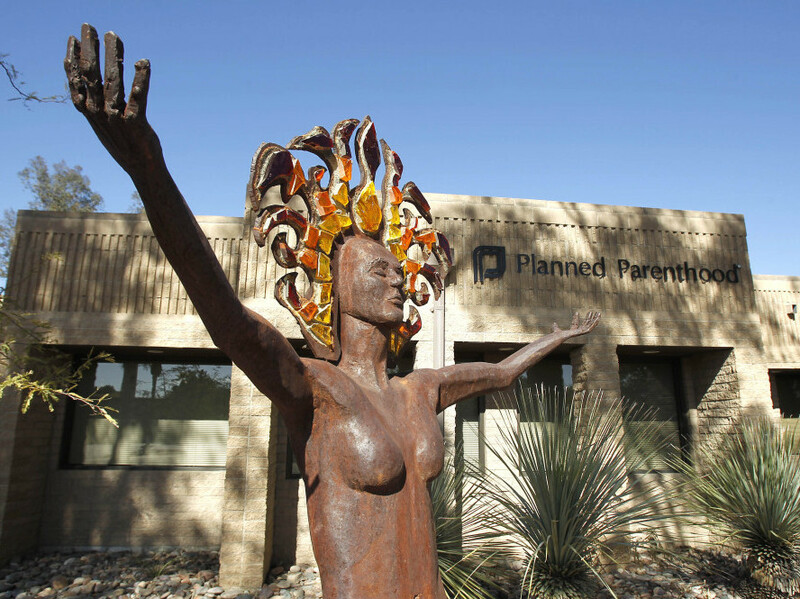 A statue symbolizing women's empowerment at a Planned Parenthood center in Tucson, Ariz. Planned Parenthood failed to stop House Republicans from voting to end the organization's federal funding in what many critics of the GOP contended was more an attack on abortion rights than an effective way of cutting federal deficits. But the organization isn't giving up on the House. It plans to run radio ads that will initially target several Republican lawmakers who voted for an anti-Planned Parenthood amendment to a stopgap spending bill that passed Friday in a 245-180 vote. Planned Parenthood identified the Republican House members as freshmen Allen West (FL), Frank Guinta (NH), Ann Marie Buerkle (NY) and Pat Meehan (PA) as well as Mike Fitzpatrick, (PA) who served in the House previously. House Democrats and other defenders of abortion rights have criticized the Republican efforts against Planned Parenthood as being at odds with GOP campaign promises in the lead-up to the midterm-elections to focus on job creation. During the campaign, Republicans faulted Democrats for spending too much time on passing the controversial health care law instead of job growth. The Planned Parenthood ads touch on that argument. They also emphasize that the non-profit group's centers provide millions of women annually with low-cost preventive health care services, including breast and cervical cancer screenings. The women's health organization provided the text of the ads. Here's the text of one called "Flushed." It's the sound of (Congressman/woman First name Last name) wasting your money. X's vote doesn't create a single job, doesn't reduce the deficit, and doesn't save you a penny. What his/her vote WOULD do is bar Planned Parenthood from receiving federal funding to do its vital work - by denying millions of women preventive care, including birth control, annual exams, and lifesaving cancer screenings. In the long run, that's going to cost all of us plenty. but instead s/he's joined a costly war on women's health care. Kaiser Health News has a very helpful guide laying out the issues behind the Republican effort in the House to defund Planned Parenthood as well as what the underlying law does and doesn't allow when it comes to the provision of abortion services at the organization's health centers.